Yes, this is yet another cost of living report on Chiang Mai. I’m sure you’ve seen more than your fair share of them over the course of the last few years. While it seems as if there’s a billion and one of these cost of living reports floating around on the Internet these days, the beauty of these reports is that every single one is different than the next. Note: This budget reflects the month of May 2013. We tracked every dime we spent for 31 days and compiled this awesome report on our living expenses. Please note that this budget is for two people living in Chiang Mai. When broken down, our costs per person came out to approximately $716 USD per person. So, some of you might be sitting there saying “What!? $1433.96, that is outrageously cheap! 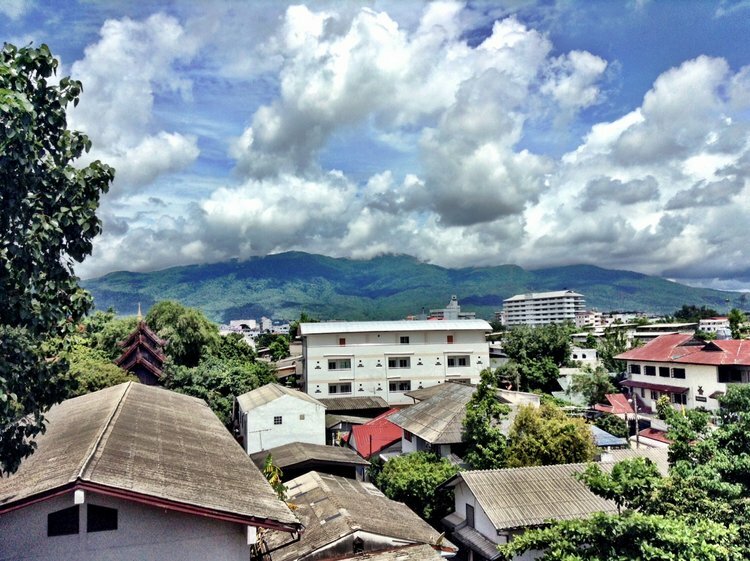 I couldn’t get a shoebox of an apartment in New York City for that” while others who have spent some time here and have figured out how to get by on sheer pennies might be saying “Whoa, you guys are seriously overspending in Chiang Mai!”. Could we have done it cheaper? Absolutely! I have no doubt about it that we could have brought our costs down in certain areas. Groceries being one of them and dining out being the other. Yeah, we love food, but I’ll dive into that issue a little later on in the report. 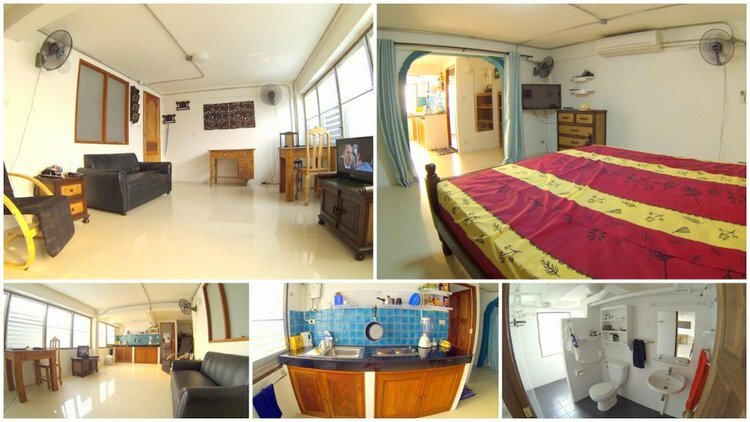 First, let’s talk about the costs of apartment rentals in Chiang Mai, shall we? We rent a clean and cozy little apartment conveniently located on the northeast corner of the old city, just outside of the moat. You really and truly cannot beat the location of this place. Our apartment is one of eight units in a 6-floor private apartment building. When we started apartment hunting we really only had two requirements. One was a kitchen because Liz wanted to have the ability to cook meals in when we didn’t feel like dining out and my most important requirement was a solid Wi-Fi connection. After visiting several apartment buildings, condos, and hotels with no luck, we retreated to Miguel’s, a popular Mexican joint for some food. It was then that I remembered I had been in contact with an English guy on Facebook who owned some property here. I remembered when we last spoke he gave me the number of his wife who deals with all of the property they own. I instantly hopped on Skype and gave her a call. Within a matter of an hour, we met with our landlord and headed over to check out the apartment. As soon as we arrived we had a good feeling about the place. The landlord, Dee, was friendly and seemed very genuine which was a nice first impression. She took us on a little tour of the apartment but we we’re still a little hesitant to commit to anything just yet as we weren’t sure how long we wanted to stay in in CM just yet. We initally thought we would like to rent month to month in case we decided we didn’t like the city, the apartment or the overall environment of the area but once we realized it would be cheaper to rent in two or three month blocks, we knew we would have to commit to at least two months in order for it to be worth our time and energy. After looking at the apartment and really taking a liking to it, we took a spin up to the roof top to check out the views of Doi Suthep in the distance. It was there that we decided that this was the place for us. I mean, just take a look at the views from our shared roof deck. We signed our lives away and ended up committing to a two month stay at first. To be honest, we couldn’t have been more relieved that our search for an apartment in Chiang Mai was officially over and done with. Since moving in at the tail end of March, we’ve extended our stay by another four months. Yeah, you could say we absolutely love living here! One thing I should mention is that electricity is pretty damn expensive in Thailand. Believe it or not, we pay just as much here (approx. $60/month) for electricity in our one bedroom apartment than we do in my families four-bedroom, two bath, home full of flat panel televisions and electronics back in the states. Note: It’s not that the electricity in our building is expensive, it’s the same rate just about anywhere you go in the city. The government rate for electricity is 2 or 2.5 baht/unit ($0.06/unit) but most apartments, condos, and rental homes in the city charge their tenants a “standard rate” of 7 thb/unit ($0.21/unit). In reality, the cost of electricity here wouldn’t be so bad if it weren’t for this “standard rate” that just about every landlord in Chiang Mai set for their tenants. Either way, it is what it is and we’re fine with paying it, we’ve just had to really watch our air-conditioning usage over the course of the last few months. The only other miscellaneous cost that come along with renting an apartment in our building is a 500 baht common area fee which is tacked on to the rent each month. The young Thai couple (family of the landlord) that live on the ground floor take care of the cleaning, maintenance, security, etc so we have no complaints of shelling out an extra $15/month for their services. We should also mention that we get our apartment cleaned every two weeks or so by the woman downstairs and it costs us a whopping $6.22. We think that’s a damn good deal considering our place is absolutely spotless once our cleaning lady is finished with it. Overall, we think we did a great job finding this apartment as it seems to be one of the best values for in town for the money (in our opinion). While our accommodations are pretty basic, there are a heck of a lot more modern looking places in town that range anywhere from $500-1,000/month depending on where they’re located, what amenities they have and how long you sign a rental agreement for. We personally know people who pay as little as $155/month for a studio apartment up to $1,000/month for a modern and beautifully decorated home smack dab inside the old city. The ultimate question is, what do you need in order to be comfortable here? Whatever your requirements may be, this place has an endless amount of options for you to choose from. If you would like some more information on this apartment building of ours, please feel free to shoot us a message. As I stated above, one of our requirements for finding an apartment in Chiang Mai was to have a kitchen. While we knew we weren’t going to find ourselves a typical western style kitchen like back home, we had our sights locked on having a two burner stovetop, a small sink and the comfort of being able to cook up a meal or two from time to time. During our first two months here we spent a fairly outrageous amount of money on groceries at some of the major grocery stores around town. At stores such as Tesco, Tops Supermarket and Rimping, you can find just about anything that you would find back home and things can really get out of hand if you stumble in there hungry! Since many of the items found at these stores are imported from the western world, they come at a premium price. 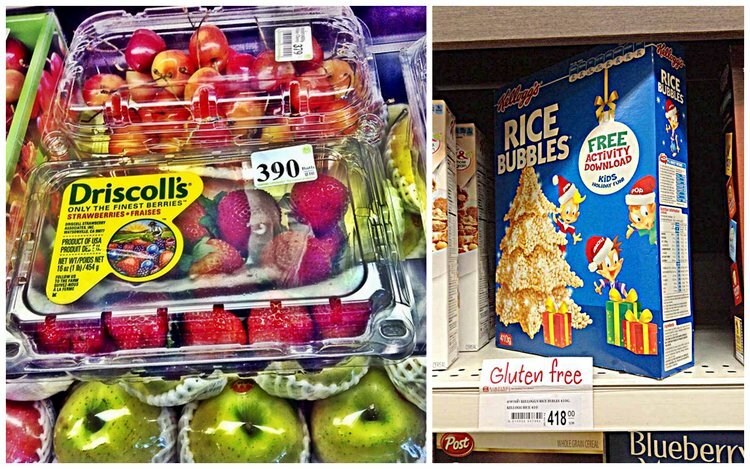 I’m talking $12 for a box of Rice Krispies (yes, seriously), over $10 for a small plastic box of strawberries, $6+ for a jar of JIF peanut butter and the list goes on. If we had chilled out a little bit on our insane grocery intake and spent our money eating out on the streets of Chiang Mai, we could have easily dropped our grocery budget down another one to two hundred dollars. We’re not going to lie here, we weren’t on a strict diet of Thai food for the entire month of this cost of living report. We definitely had our fair share of western food as well and we’re completely content with that. While we know we could have really cut costs on dining in Chiang Mai, we wanted to continue enjoying some of the treats we missed most from the western world. A western dish at a western restaurant in Chiang Mai will set you back anywhere from $4-$15 depending on what you’re looking for. Western food prices are less in Chiang Mail, although that being said, it can be a tough task to find the quality of food you’re used to eating back home. It took me a while to find a good burger around here. I tried the burgers at 3 Little Pigs, Loco Elvis, and Duke’s. While all of them were tasty, none compared to the burgers I’m used to devouring back home. Same goes with pizza, we’ve tried just about every restaurant in town that serves pizza including Girasole, Da Stefano, Pizza y Vino, Paradise, Dailycious (Liz’s fav), La Ventana, Duke’s, Sahara, Boutique de la Pasta (my personal fav). As for Thai food, everyone seems to have their favorite little spots around town. Our favortie Thai joints happen to be not too far from our apartment which is very convenient when you’re hungry and don’t want to travel across town to chow down. A few of our favorites include Nine’s Restaurant, Barnnakarn Kitchen, Anchan Restaurant and just about any street stall with a line out front of it. Most Thai dishes range between $0.93 and $2.15 for a decent portion of food that will be sure to fill you for the moment. It should be noted that portion sizes are smaller than your typical (giant) portion size back home. 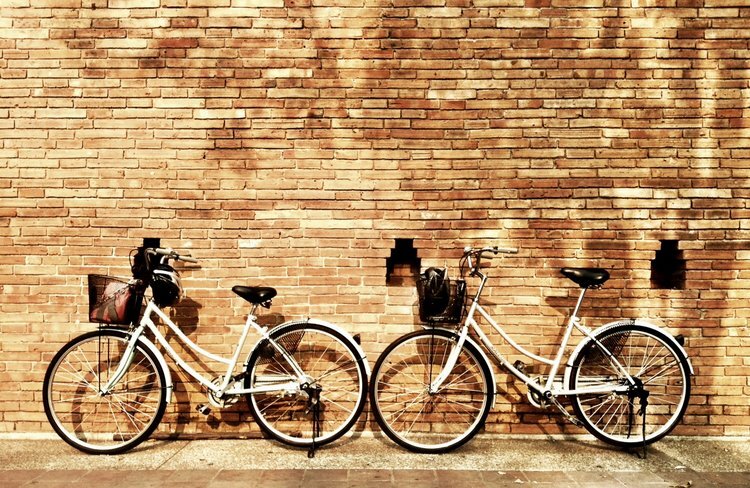 One of the first things we purchased when we arrived in Chiang Mai was bicycles. We headed down to Cacti Bike, the best bicycle shop in town (IMO), located on 94/1, Singharat Road and picked up two secondhand Raleigh Cruisers for approximately $100 dollars each. Looking back on it, we now realize that this was hands down the best investment we made during our stay here. We’re very active so we couldn’t see ourselves navigating our way around the city any other way. Another perk about buying a good quality bicycle here is that you can always sell it to someone when you decide to leave. We rode our bicycles around town for five months with little to no repairs needed and sold them for $70 when we were finished with them. Let’s do the math here: $100-$77=$23 for five months of transportation. The majority of expats rent motorbikes here for anywhere from 2,000-3,000 baht per month ($62-93 dollars per month). While we can’t deny that it’s a heck of a lot more convenient to have a motorbike when you want to get somewhere fast or far away, we rarely ran into a situation where we said, “Man, I wish we had a motorbike!”. We probably could have used one twice in the last six months, other than that we were happy as hell to be exploring the city by bicycle. Pedal power, baby! We tried our best to avoid riding our bicycles at night here so most nights we would either walk or hop in a songthaew (red truck) which takes you just about anywhere inside and a mile or two outside of the city for 20 baht ($0.62/pp). We love songthaews and we use them just about anytime we want to head out for the evening. 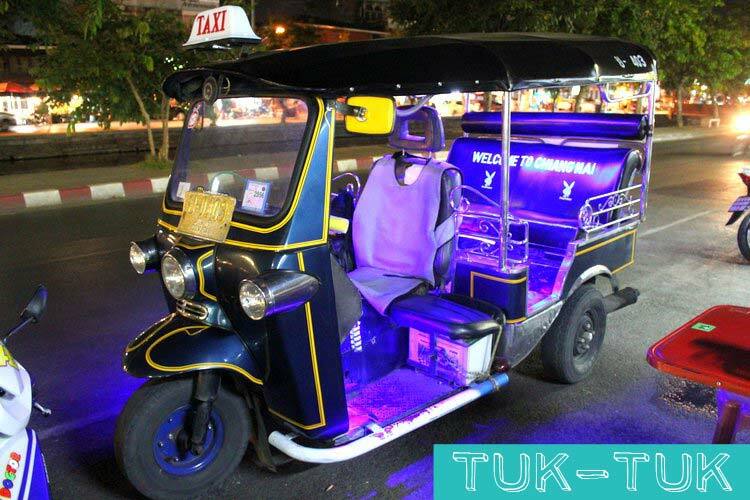 We should mention that a songthaew is basically a group taxi so it stops and picks other people up and drops them off along the way so if you’re in a major rush, skip the songthaew and grab yourself a slightly more expensive ride in a tuk-tuk. Tuk-tuk’s are everywhere in this city. They’re loud, obnoxious and would fail miserably in an emissions test back home. It seems as if everywhere you go, you hear the words “tuk-tuk!” yelled from across the street as the drivers try to get your attention. If you’re in a rush or you want to go somewhere directly, this is what you’ll want to take. A good rule of thumb for tuk-tuk’s is to pay approximately 20 baht more than you’d pay a songthaew to take you to your location. For example, if we’re headed from our apartment to Chiang Mai University, a songthaew costs us 20 baht per person ($0.62/pp). A tuk-tuk to the same location should cost us no more than 80 baht. As you probably noticed above, our “Other” category of the budget consisted of a bunch of miscellaneous things such as stops into the pharmacy, massages, and other bits and pieces of entertainment along the way. I’m sure you’re probably wondering why we didn’t split Entertainment into it’s own category, right? Well, we really don’t get involved in too much “entertainment” other than things like going bowling with friends from time to time, attending a free music festivals, taking part in the world’s largest water fight and getting dirt cheap massages on a weekly basis is pretty damn entertaining. For those of you who are interested in the price of massages here in Thailand, let me blow your mind with these prices real quick. A 60-minute full body Thai massage here at Young & Beautiful Massage (our fav massage parlor) in Chiang Mai goes for $6.20 and you can find them slightly cheaper if you look hard enough. In short, you could get 10, one-hour, full body massages here for the price of one back home. One of Liz’s favorite types of massages is the 30-minute leg and foot massage and she shells out a whopping $2.48 each time she gets one. Oh, and I should mention she gets a lot of them. Another thing to note is how much money we have saved over the course of the last few months by simply staying away from the bar scene. It’s not that we’re against drinking or anything, we were just never big drinkers in the first place. We’re the type to have a drink or two once every month or two. Not only does our lack of drinking save us from throwing our money down the drain, but it also keeps us off the streets and home before midnight on most occasions. If there’s one thing I’ve learned through all of my travels over the years, it’s to stay away from the bar/nightlife scene after 12-1AM no matter where you are in the world. If you’re out drinking and wandering the streets of a city you’re unfamiliar with at that time of the morning, you’re asking for trouble. Just about every traveler and tourist I’ve ever met that’s been robbed on the road has been walking home from a bar in the early morning hours. It’s simply not worth it. 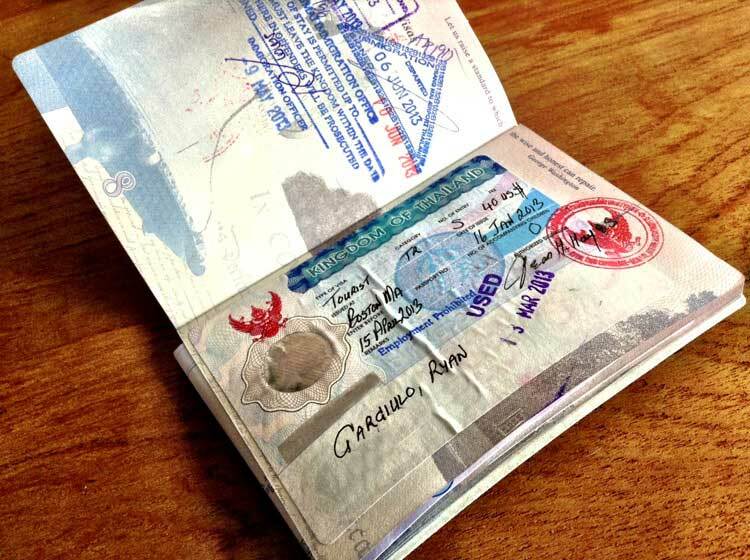 As you may have noticed in our breakdown above, the month that we tracked our budget also happened to be the same month that we had to head to the immigration office here in Chiang Mai to extend our visas for 30 days. Considering that extending your visa is not an actual monthly expense, we could potentially remove the $129.56 from our total budget from the month and we would be down from a total of $1433.96 to $1304.40 or $652.20/per person. Tip: Be sure to check out: Requirements for Thai Tourist Visas, an incredible resource for those of you who want to learn more about the requirements for obtaining a single entry, multiple entry and 30-day extensions of your Thai tourist visa. 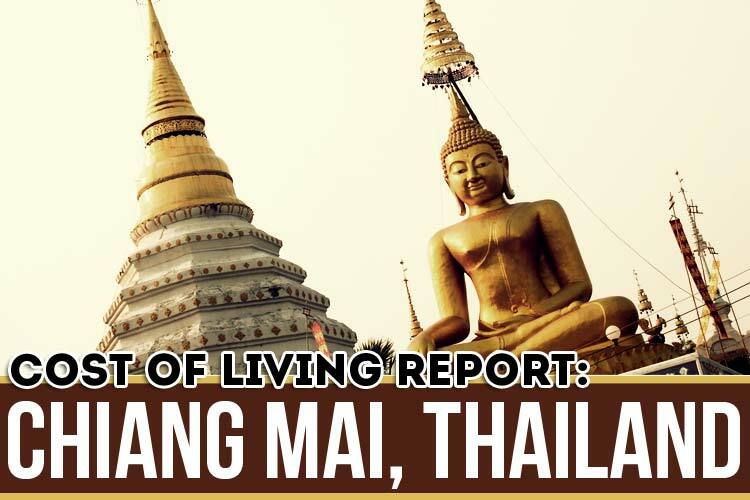 Well, that just about wraps up yet another cost of living report for Chiang Mai. As we mentioned in the beginning of the report, we spent a grand total of $1433.96 for the month of May and $1304.40 if you subtract our Thai visa extensions. Either way, we’re content with the majority of what we spent during the month. Sure, we could have done better, but we’re not stressing about it. Life is too short to be counting pennies! DID YOU FIND THIS REPORT HELPFUL? IF SO, PLEASE DO US A FAVOR AND SHARE IT! Thank you for this post, that’s very interesting!! After living a year in Istanbul (where I spend about 500 USD/month for all incl.) I’m looking for another cheap place to live. I might try Chiang Mai and I really love the Thai Food! No problem Sab! $500/month in Istanbul, wow! I thought the cost of living there would be quite a bit higher than that. Very interesting! Chiang Mai is awesome, we love it! We will definitely be back here again at some point next year. Great report and breakdown of costs! My husband and I are planning on living in Thailand during our travels so I’m always interested in finding out more on the cost of living. I’m going to keep in mind you have a contact for rentals once our time to live there gets closer. Thanks Kimmy. I appreciate the feedback! You’re going to love it here. Feel free to contact me once your trip gets closer and I’ll put you in touch with my landlord. Good clean honest budget. We are always comparing what we spend to see if we can’t shave off some satangs here and there. Gotta love a well put together budget post. Thanks for all of the help you guys. See you when you come back! Thanks guys! Any idea what you guys are spending per month on average here? Would love to hear! We’ll definitely be back! Catch you guys again soon. Our “budget” is $1,200 a month, but we let it slide a bit now that Angela has been teaching. We are suckers for different kinds of food too. In reality we are probably not far off from you two at all. Awesome. Thanks for sharing. As much as I hear people saying they spend a lot less. I think 1000-1200/mo for two people is probably pretty average here. We could have lived off straight Thai food but we wouldn’t be enjoying ourselves as much. Still a heck of a lot chepaer than home! 1) i live in a very secluded place,where me and my bf are the only foreigners. Great post. You guys did a good job tracking your expenses. We always try, but it’s a challenge to keep everything straight. Love the flat. It’s beautiful! Thailand was a base during our 4 or 5 months in Southeast Asia. We were in and out, but we’d really like to spend some more solid time just there. Thanks for the report and the inspiration. Thanks Tamara. It’s not easy to keep track of everything! Yeah, we’re really going to miss our apartment, that’s for sure. Maybe we’ll cross paths here in the future. Great post guys! My mother is retired in Chiang Mai and those costs are consistent with what she pays (except her food/grocery bill – but as you say you guys like to splurge a bit on that). Actually, you’re almost a neighbor, she’s got the same view you have from her apartment. She complains though that CM getting too busy, that in the past few years there’s been a huge influx of foreigners. 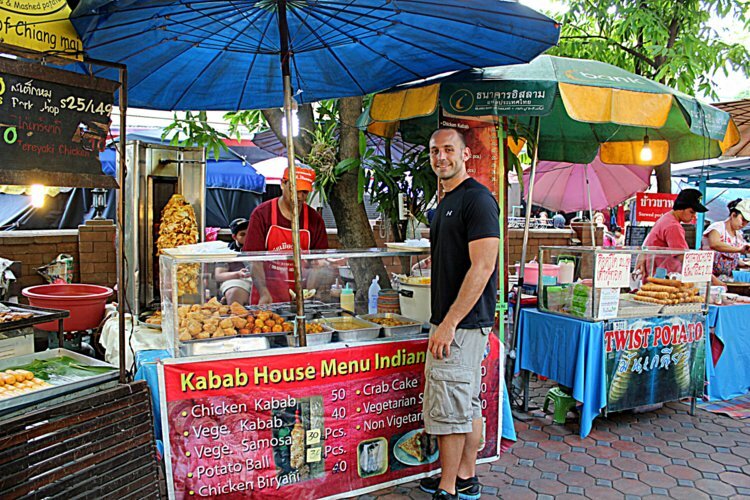 It’s funny seeing some of these blogs – you must constantly be running into people like Nomadic Samuel and all the other bloggers that seem to live in Chiang Mai? But I’ve been a few times and it’s a great spot to base yourself, exotic but with all the conveniences of home. And the Thais are great. Great work with the blog! Thanks Frank! Cool to hear that you’re mother has decided to setup shop here. I would say there are more foreigners here than the last time we were here in 2010 but that’s not too much of an issue for us. Lots of inspiration swirling around this city business wise. Unfortunately, I never actually ran into NS. I did run into a few others though. Thanks again for the feedback. I have been studying moing there. But what i am realizing is that the pollution is rarely mentioned. Have you guys stayed there though the burning season? The pollution i am afraid might ruin our stay. Thanks.. The smoke pretty much only affected our initial month or so here. It is bad without a doubt. We would think twice before coming here during smokey season next year. That being said, we never got sick or anything like that. It’s one of the few cons of living here. Interesting post. My wife and I visited Chiang Mai a for three days a few years ago and loved it. Did either of you get sick from the food or the water? Did you do any hiking in the mountains? Do you take malaria pills? What is a typical day for you? Are you using savings and have you quit your job in the States? No, you do not need malaria pills here. To be honest, you really wouldn’t need them unless you were going deep into the jungle. You’re much more susceptible to Dengue. Lots of people get it here. Just had two friends get it within the last couple of months. A typical day for us is to wake up, work out, and then hop online and get some work done. We have some online income streams that keep us afloat as well as savings as an emergency backup. Neither of us have jobs in the states. We work online blogging, freelance writing and earning income through a variety of online streams. Yeah, we enjoy those Kebabs but the best ones are found at Zoe in Yellow or CNX Kebab. Thanks for the feedback. Hope to see you guys again soon. Really enjoyed this post! I think it sounds like an amazing deal for the money spent and experiences had! Thanks Lisa. It’s a great place to live, for sure. Tons of useful information here. We’re planning on 2-3 week stopover in Chiang Mai in the December time frame. Thinking about doing the Mae Hong Son Loop on motorbike so good to know roughly what renting one of those might cost. Thanks for posting. Thanks for the feedback Nicholas. The Mae Hong Son loop on a motorbike sounds like a great time! Would love to hear how that goes. Hello, I need someone who has experience in tourism in Chiang Mai and want to know more about the hotel. Attractions. Includes motorcycle hire. Where is the good service and not expensive prices for travelers. And I know that this is a good motorbike for rent. Do you know or not. Please recommend the hotel you stayed or where you have a restaurant or rent a motorbike etc. One hell of an expense report! Seriously helpful…my girlfriend and I are spending a month of so in Thailand on our RTW trip…good to know what specific things cost! Thanks a lot Wade! Glad that you found it to be helpful. Enjoy your trip! Thanks Wade. Glad to hear you found it useful. sawadee ka. great read. thanks. we are heading to chiang mai in mid november for four nights. any advice on a day trip to the surrounding mountains, jungle, waterfalls, temples? we are day tripping to an elephant sanctuary for one day. thanks and peace! Thanks Susan. There are so many things to do/see in and around Chiang Mai that I wouldn’t even know where to begin. 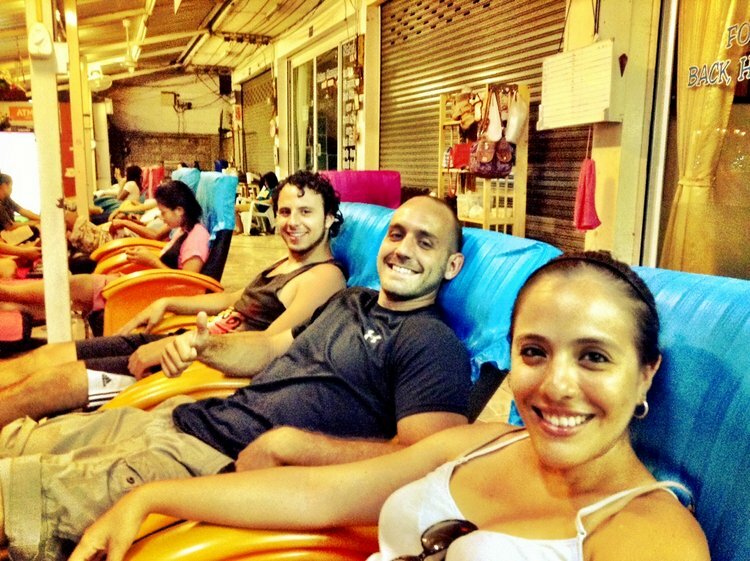 Check out Wikitravel Chiang Mai to get some ideas on things to see/do in the area. As for in the city itself, don’t miss out on the temple at Doi Suthep! If you decide to visit an elephant sanctuary, go for Elephant Nature Park (highly recommended) or Patara Elephant Farm. All other “elephant sanctuaries” in and around the city are not somewhere you want to visit. Trust me. Love the transparency in your budget breakdown. This is a great resource for anyone; those planning to go and those already there. Thanks Maria. Glad to hear you found it helpful. Wow I love this breakdown! I’ve never read one like it and I love the pictures that went with it, your place looks so cool! Thanks for sharing! Thanks for the comment Diana. Glad you found it interesting! Great breakdown. Very informative. I’ve lived in Taiwan, but never been to Thailand. I have a friend who works 6 months out of the year in NY and then lives in Thailand the other 6 months. He’s building a house on the beach there. Between you and him, I’m very intrigued about living there for a bit! Fantastic, detailed breakdown! My boyfriend and I are traveling around Asia, and generally hover around $600-700 per person, too. I’m mighty curious about your apartment! We’re heading to Chiang Mai for about three months this November, and, like you, we are in desperate need of a kitchen. Any chance you could pass on some contact details? Even some general tips for finding accommodation would be smashing. This is an amazing level of detail in this post. I love that you mentioned exactly how you found your apartment and your favorite massage place. You know you got a good deal if you spend more than twice as much on food as on rent!! Hey man, love your blog! Wanted to ask where you found your place for so cheap! My Fiancee and I found a place on airbnb, but it ended up costing $30 per night, so we paid $450-500 for two weeks, and I thought I found a good deal! How did you find a place so cheap? Thanks! Hey there, I’m hoping to move to chiang mai in the next few weeks. Any recommendations on how I should go about finding a place to rent. I’m used to just using Craigslit but i’m assuming that’s more a north american thing. Yes another “how much it costs to live in Chiang Mai” great post with lots of detail though I don’t see why you posted it in USD when you’re actually paying in Thai Baht, please not someone on the post the exchange rate you used. Thank you very much for this detailed breakdown of all the costs you had. I plan to live in Bangkok next year (at least for 6 months) so I will maybe have a little bit more to spend on the accommodation but I am convinced that I can do it with expenses of about 1000 dollars per month. I read more and more about chiang mai and the more I read about it the more interesting it gets to visit this place too. I have never been up north. Maybe we’ll catch you in Chiang Mai in the near future! Thanks for the blog. Great resource. I have been living for 2 years in Pattaya and want to make a change, Chang Mai is an option. I have visited several times and really enjoy the more laid back nature of northern Thailand. btw, songthaews (which means two [song] rows [thaew]) are color coded in Chang Mai. There are red, yellow, white, green, orange and blue songthaews depending on the route. As a stats nerd myself I love this post. We’re trying to decided where to hole up for a while and we both like Chiang Mai so we are definitely considering it. Thanks for all the work you did on this. Cheers. Hi Ryan! Just found your blog while searching for houses in Chiang Mai! I am aware this was nearly 3.years ago…but is there any possibility of you letting me know where this place is located? Or do you still have contact details for it? We will be staying in Chiang Mai for 3 months from the beginning of July, so any help/guidance would be great! Chiang Mai is probably the best in Thailand and in the world as well. I live in Thailand and I use to visit there from time to time. You can find nice rooms for monthly rental in monthly budget of 6000 THB. The meals at the local restaurants cost between 50-100 THB. That’s the reason why many expats choose to live there. Like your experience in Thailand, that was a great article, hope to travel to Thailand one day.